1. / APOLOGIES: Ken Diggins, Julia Vincent, George and Lynda Wallbanks. 2. / MINUTES of the meeting held on 12th November 2013 were agreed. a / High-backed chairs have now been purchased. b / Car park lighting has now been installed. e / The receptionists had taken on board comments received from the suggestion box concerning their attitude. 6. / Triage Questionnaire – It was noted that 110 replies to the questionnaire had been received either from emails or patients completing forms while attending surgery. This was still a poor response but better than last year's follow-on survey. In analysing the results, members concurred that the triage system was working well and this was substantiated by the general comments patients had also made when completing the forms. In further discussion, members agreed that some of the questions may have been misleading and that we need to be smarter next time when devising questions. 7. / Suggestion Box – there was nothing to report to the meeting. 8. / Sharing Medical Records within the NHS Model – Sarah reported on future systems being introduced to the Practice on a national basis that will share patient data. The default option for two systems will be to automatically share patient data unless patients opt out. Care.data – the entire patient record including personal details (except name) will be transferred to the Health and Social Care Centre. It is hoped that from the data collected, the Dept of Health will be able to improve or redesign health services across the country. Patients will have to opt out of this scheme by signing a consent form designed by the Practice. Summary Care Record – information on patient’s records will be shared with other Health organisations such as the Ambulance Service and Accident and Emergency. Information such as allergies, repeat medication etc will be extremely useful when patients are using these services. Patients will have to opt out if they do not wish their records to be shared. Enhanced data sharing model – patient records will be shared with organisations using the same clinical systems such as the District Nursing Service. Patients will have to agree first before information is shared with other organisations. Telephone Access – the practice are to employ 2 new apprentices to answer the telephone. An extra extension is being fitted and the advert is out for two younger people to work at the surgery. Volume of work the practice is undertaking with two doctors currently off work. The local Clinical Commissioning Group is holding a seminar to identify priority areas where resources are required and also issuing posters to help educate patients to “help themselves”. Phlebotomy Services – Sarah reported that the Clinical Commissioning Group had commissioned insufficient blood tests for the number of practices they were responsible for. 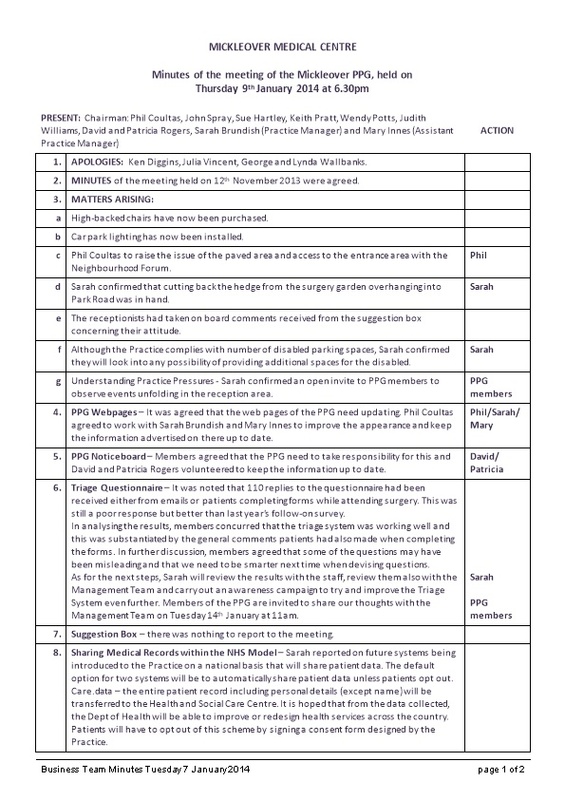 It was likely this would become a major pressure in the future and support from PPG’s for the practices was essential if this service was to continue in practices. Re-visiting the constitution and re-appointment of officers will need to be done at a future meeting.